Mike Smith. Photo by Vas. 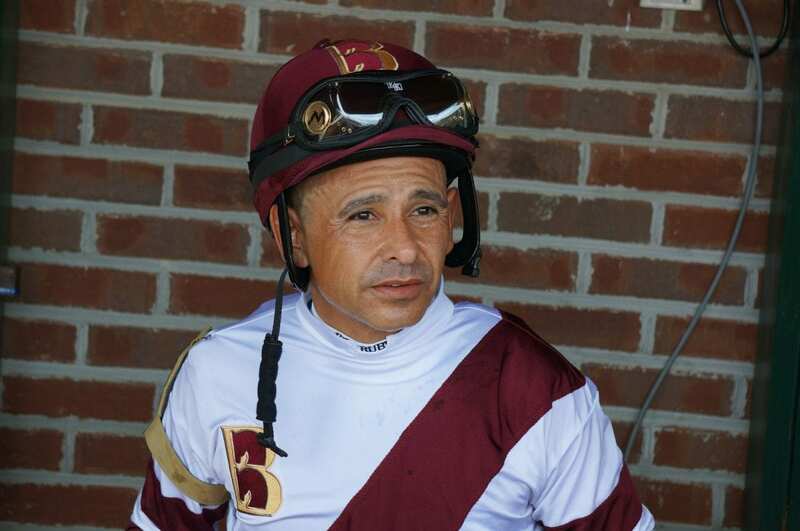 Hall of Fame jockey Mike Smith, who rode Justify to a sweep of the Triple Crown in 2018, will be honored, along with Donna Barton Brothers, Jim Gluckson and Marty McGee during the National Turf Writers And Broadcasters 59th annual Awards Dinner on Oct. 31 at Whiskey Dry by Edward Lee in Louisville, Kentucky. Smith, the winner of more than 5,400 races and a member of the Hall of Fame since 2003, will receive the Mr. Fitz Award for typifying the spirit of racing. Smith is the all-time leading rider in Breeders’ Cup history with 26 wins and nearly $36 million in mount earnings. At age 53 he rode Justify to a sweep of the 2018 Triple Crown, representing the sport of racing in idyllic fashion throughout the high-profile series; his interactions with both his fellow racetrackers and the public at large were exemplary. A native of New Mexico, Smith has become very well acquainted with horsemen and fans throughout North America by way of his extensive travels, having started his career in the Midwest, New York and Florida prior to making Southern California his primary base since 2000. Smith’s $314 million in career purse earnings ranks second all-time, just one of many indicators of his phenomenal success and positive influence in the game. Barton Brothers, one of the leading female jockeys of all time when she retired in 1998, will receive the Jim McKay Award for excellence in broadcasting. The daughter of trailblazing jockey Patti Barton and one of the leading female riders of all time, Donna Barton Brothers began carving out another standout career when she first delved into television coverage of racing in 1999. Since 2000, Brothers has covered racing and other horse sports for NBC and NBCSN and, during that time, NBC has been honored with 13 Eclipse Awards for live television coverage. Gluckson, a longtime publicist and head of media relations for Breeders’ Cup Ltd., will receive the Joe Palmer Award for meritorious service to racing. Gluckson works with members of the press to cover the annual world championships. He also is involved with the Eclipse Awards as a member of the Steering Committee and helps coordinate coverage of the annual awards dinner. A graduate of Skidmore College, Gluckson also worked in various capacities with the National Thoroughbred Racing Association. Through his longtime association with SFX sports agency, Gluckson was presented with the Red Smith “Good Guy” award by the New York Turf Writers Association at its 2005 awards dinner in Saratoga Springs. Marty McGee, who has been with Daily Racing Form since 1992, will receive the Walter Haight Award for career excellence in turf writing. McGee has covered Thoroughbred racing for over three decades. He joined the Form after working at the Baltimore Sun for seven years. McGee currently covers the year-round Kentucky racing circuit as well as winter racing at Gulfstream Park. He has attended every Kentucky Derby since 1974. He won an Eclipse Award for feature/commentary in 2013 for his story about the Desormeaux brothers before Keith became a prominent player on the national stage. The NTWAB Awards Dinner, which is traditionally held during Breeders’ Cup week, is the organization’s only fundraiser and a portion of the proceeds from the event are used toward scholarships for prospective Thoroughbred racing journalists and to support Thoroughbred industry charities.